When we have friends over for dinner and are serving wine, I set this oil painted canvas outside my front door. I believe it creates the first step in setting the mood that "Fun is going to take place here!". I want my guests to feel like they are entering a place that is equal to or surpasses any fine restaurant they have visited. Rather than the ordinary "Welcome" signs, I'm convinced this is a more delightful way to create the mood you want to be enjoyed. I believe I purchased it for about $20 at WALMART! Many of my guests comment on how special it is. 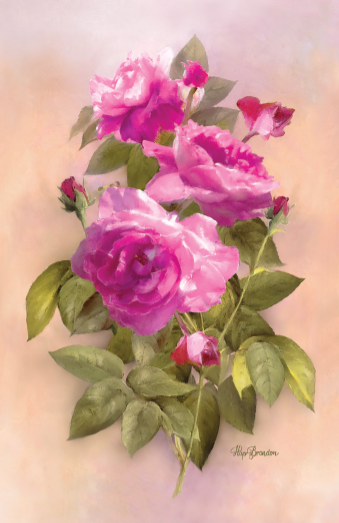 Do you have a painting of some kind that you have just been storing that you could hang outside your door? Remember to bring it in after the party! 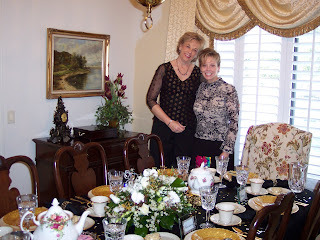 I can still remember a dinner I attended at my friend Dory's house years ago. She served 24 of us delicious spaghetti, a perfect salad with Italian dressing, and served us this delightful Italian Cream Cake accompanied by authentic Spumoni ice cream. It was not only beautiful, but it was so tasty that I remember it to this day! Don't think you can get away with baking only two layers instead of three. You will have to bake the cakes longer and they will overcook on the tops, bottoms and sides. Bake at 350 for 25-30 min. I did for the one above. It tasted good, but you could see the separation in the layers. Grind up 1 cup nuts (pecans) and sprinkle on top of cake. Serve with Italian Spumoni ice cream. This weeks floral arrangement was so beautiful. We featured Gerber Daisies, Dahlias, bright yellow lilies, purple liatris and green Bells of Ireland. The lilies have opened up and are glorious! Tonight we are creating an arrangement with lights and dragonflies. Can't wait! Next week class attendees will be making a 4th of July floral arrangement. There is room for you if you wish to attend. See info on Blog Post: Chabby Chic Flower Arrangement for details. 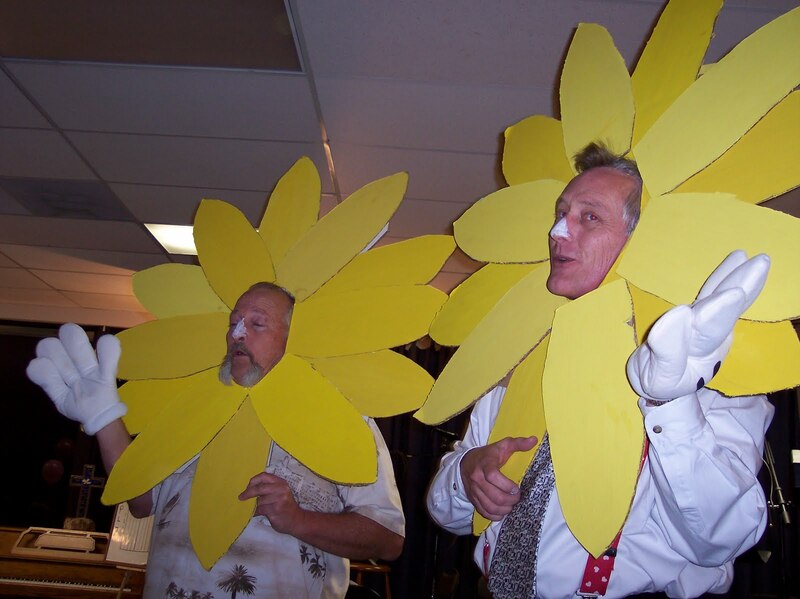 Parties are such great fun, full of festivity, and they affect every one of our five senses. I LOVE parties! Have you noticed that not too many people have parties or special events in their homes anymore? Many people have chosen other venues for parties these days. There are advantages and disadvantages to both. These are some important questions and considerations a hostess must ponder before a celebration. How much will it cost? Will the cost be shared? Will it be a pot-luck or will we prepare everything ourselves? Vacuuming, dusting, general cleaning, window cleaning, grocery shopping, chopping, baking, cooking, refrigerating, invitations, music, scents or no-scents, candles, lighting, flowers, decorations, party favors, washing or polishing rarely used serving items, yard work, etc. Will it be catered, or will we do the serving ourselves? If served, what happens if someone drinks too much alcohol? What if someone ruins a carpet, piece of furniture, or treasured antique? What if the guests way overstay their allotted time frame for the party? How comfortable am I with people moving about in my kitchen when I am performing last minute preparations? How much time am I willing to invest in planning, preparing my home, orchestrating special touches, and final clean-up? Will there be children attending that I will need to keep entertained? Will this be a complimentary mix of people? What do I need to plan so that everyone will feel important and have a delightful time? As you can see, so many components are a part of planning a party of any kind. I say it is worth the time, effort and risks! I have so many happy memories of time spent with family and friends in my home. Something worth knowing: When hosts have singled you out to be a specially invited guest at an event, no matter what it is, it means they may have left others off of their list because they really want YOU to be there. So your invitation is special! In order to plan well, hostesses need to know if you will be attending as soon as possible. This not only builds excitement into the anticipation of the event for them, but it also insures excellent planning on their part and that there will be enough food, beverages, favors, tables, chairs, linens and dinnerware for each person. 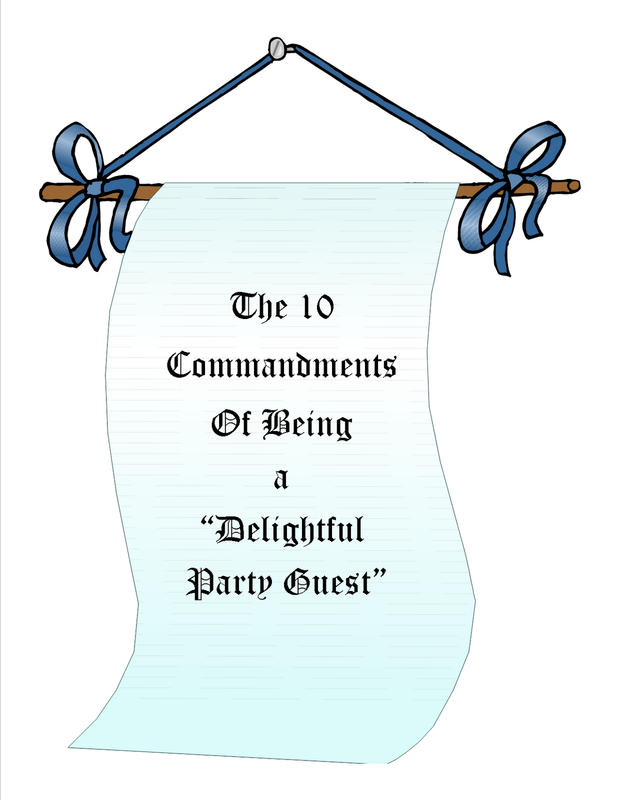 See Blog Post: The Ten Commandments of Being a Delightful Party "Guest" listing ten ways to insure guests and hosts both have a great time. While you can’t include these in your invitations, you can refer to them for when you or a family member is invited to a special event. These are common sense, but sometimes people need to be reminded of proper manners, which are always treating other people as you would want to be treated. 1. Thou shalt RSVP ASAP! (Respond please, as soon as possible). The hosts have graciously given you the special consideration of an invitation; it is imperative and courteous to give them the reciprocal consideration of responding promptly, affirmatively OR negatively. Your hostess needs to know in order to plan and the general rule is, “If you do not respond, you are not included in the count”. It’s not polite to show up if you have not responded.2. Thou shalt keep your word, even if it HURTS! Don’t wait for, or, accept a better offer if one emerges; or even worse, simply not show up when you have responded that you will attend an event. Hosts have spent money to include you and may not have invited others due to space limits. Your host is truly disappointed if you can’t make it.3. Thou shalt not inquire from others if they have been invited prior to an event or asseverate being invited after the event. In the event that they were not invited, you have spared hurting anyone’s feelings.4. Thou shalt inform your host as soon as possible If it is “absolutely unavoidable” that you cannot attend after giving a positive response to your hosts invitation. Inform your host as soon as possible with a personal call. This is the kind thing to do. Your host will appreciate this and may still be able to invite other guests to take your place.5. Thou shalt arrive as close to the starting time as possible. Fashionably late is not considerate of your hosts planning and serving. It is a real challenge to time everything right to serve multiple dishes to many people and serve the hot dishes hot and the cold dishes cold. Having to wait for someone while trying to orchestrate a well-thought-out plan causes frustration, disappointment, disarray and over-cooked food.6. Thou shalt not DISPLAY or USE your cell phone during the event unless you are a professional who is on-call during the event. Almost nothing is more annoying or rude to your hostess or other party guests. “Love the one(s) your with”. By spending time conversing, checking email or texting while you are at a party, you are basically saying with your actions you’d rather be with someone else, or be somewhere else. Not nice! In fact, it is really rude. This goes for restaurant meetings too!7. Thou shalt be a fun guest! Have appropriate senses of humor, either creating it or enjoying it. Crudeness is not appreciated, appropriate, or welcome. People who engage with other people, who ask friendly questions, share, but not dominate the discussions. People who are good sports when games are played, questions are asked of them, or help is needed. Participating in the menu is a nice gesture, but be sure your hostess would welcome such a gesture. Sometimes they prefer to have complete control over what is served. Sometimes, your help is really welcome. Stay long enough to demonstrate they had a great time, but not so long as to overstay their welcome. Subtle signals are usually given when a host is ready to end the event. Do not drink too much alcohol. No one thinks this behavior is funny. It places your hosts and the other guests in an uncomfortable position. The event should not be about you--excellently or disappointingly, unless the party has been given in your honor. Do not bring up, describe, or elaborate in great detail about health issues. This is a time to have fun! Leave yours and other people's problems at home for a few hours. Offer to help clean up and do dishes. Many hosts would never allow it. It depends on the event. If you can see that there is a massive amount of cleaning ahead, offer to help if you are able. Your host can always say, “No, thank you”. If that is the response, honor that, as that is how they really feel. If you have a special talent or gift, you might offer your service to your host. Singing, playing an instrument, making special beverages, preparing a special dish, planning activities for the children, bar-tending, or assisting with the serving of food items, etc. Don’t continually ask if you can do something for the host. Once you have asked, they will know that you are someone they can ask, and they will if your assistance is needed. Be cordial to everyone, and try to have a conversation with each guest at the party, unless this is an extraordinarily large event. Be sure to take with you any items you arrived with. It is considerate to do this so that your host doesn’t have to track you down to give you your dish, coat, or whatever items you left behind. If you must leave earlier than the allotted parting time, search out your host and thank them and compliment something that made the event special to you. It is best to inform your host before you arrive that you need to depart early. This way, it isn't a surprise and they don't think you weren't having fun. 8. Thou shalt not complain about any aspect of the party or argue with spouse or another guest. This makes everyone feel uncomfortable and puts a big damper on the evening! Agree to disagree agreeably.9. Thou shalt express thanks when leaving “and” send a “Thank You” note within days of the party. Express your appreciation for being invited, what specific fun you had or thing that impressed you and another thing that will make your host remember the event positively. If something went wrong, encourage them for the next time. Guess who will be invited back in the future!10. Thou shalt reciprocate. Follow these simple guidelines and you will always be considered a delightful party guest. Right after I made it! At any rate, I obtained permission from my instructor that I could invite friends! This week we will be doing a Summer Beach Ball arrangement. 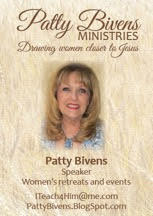 I'm not sure if it is too late to attend this one or not as Pam has to purchase the materials ahead of time, but here is Pam's email address if you wish to inquire:minniesmama06@aol.com. The classes are $25 weekly, which includes a unique container and the flowers! The class starts at 6:30 pm sharp, and it is held at 300 N. Rampart St, Orange, just off Chapman across the freeway from UCI Med Center. It is in the community center of a mobile home park. The room is huge, lots of room to move about and talk! Hope to see some of you there! The "High"way or the "Fair"way? I am ashamed to say that when a friend was telling me a story of how she had been wronged, I immediately took her side, empathized, and advised her to take action toward the one who had wronged her, which would have been fair. She explained to me how she felt. Even if she has been and continues to be wronged, she feels she has been called to remain a positive influence in the life of the one who has wronged her, no matter what. I await to see the final outcome of her stand. In the meantime, I want to share some words I recall saving in my archives that came to my mind after our conversation. Words that I should reflect on more often. I am now so "conscious" that I need to think long and hard before opining, and consult the Lord in prayer before I spew life-altering advice. After I knew the "beauty" in her heart, God confirmed in so many ways that she was right. The Lord's way is usually not the easy way. I suggested she should deal with this person "fairly" and move on--take the easy way. She continues to endure pain from this one. But we both came to the conclusion that "Love never fails", and it is worth the cost. I don't imagine I would be so happy if God dealt with me "fairly" every time I messed up! He has so much mercy, and so does my friend. The words below came to my mind that I had heard at a business meeting many years ago about how virtuous living is accomplished in this world by "maintaining" a difficult position and "being" a positive role model. I desire to be a positive role model in the lives of my family and friends and this inspires me. I hope it will inspire you as well. The following words appear to be based on a composition originally penned by Dr. Kent M. Keith, but much of the second half has been re-written in a more spiritual way. Both versions are shown below. I think if I and others could better LIVE these words, not only my world, but also the world of others would be so much more delightful. I love America and I love decorating for and celebrating the Fourth of July with friends each year. It really launches summer for me. For this table, a table topper square was constructed from a sparkling fireworks fabric to highlight a Fourth of July theme. Easy-To-Make Fourth of July Cherry Pie: Fill a prepared pie shell with Comstock Cherry Pie Filling. With a second pie shell, cut out star shapes in varying sizes. Place them all over the top leaving room for the red cherries to show. Sprinkle the stars with red colored sugar and bake the pie according to directions. A decorative fireworks pick was inserted to add the finishing touch. A luncheon table was set for family members utilizing royal blue bandanas purchased at Michael's for under $2.00 each. Melamine star plates were purchased from Target. American flags can be purchased at any party supply store or Michael's. The rattan stars and Margarita glasses used for ice cream and cooked peaches were purchased from Pier 1. Patriotic napkins can be purchased at your grocery store, party store, or department stores like Target. Colored votives were purchased at Michael's. Azalea plant was purchased very inexpensively. Decorative glass vases are very popular now and these added the perfect touch I wanted for drama. American flags and fireworks sprays were added to show some pizazz. Vanilla ice cream and baked peaches topped with cinnamon were served in Margarita glasses and adorned with an American flag pick. For this party, along with the dessert, barbecue ribs were served with Best Foods Mayonnaise's recipe of Classic Potato Salad. My mom's barbecue baked beans, (yum! ), baked corn on the cob, (so great because it doesn't get soggy!) Bake in a casserole dish for 30 minutes at 325 degrees. Add whatever spices you like. Everyone always comments about how good it tastes this way. Additionally, watermelon slices were served with blueberries and ice. A simple three ingredient Cole slaw was served. Purchase two bags of green and purple cabbage mixed with shredded carrots; add a mixture of 1/2 cup vinegar and 1/2 cup sugar. Chill and serve. Sooooooo good! Place 2 large cans of B & M Baked beans in a bowl. 2 to 3 handfuls of brown sugar. Place the mixed ingredients in a buttered 13 X 9 inch casserole dish and cover with foil. Bake at 275 degrees for 45 minutes. Remove foil and bake for another 45 minutes. I'd love to hear your comments on how you celebrate the Fourth of July.